A long time ago now…my friend Annabel was teaching a cooking class and invited me to be her prep cook. At that class, she made this delicious dish. And whenever I am feeling like I need a little love from Annabel, I will make it. It’s super healthy, hearty, and a perfect dish for a cold winter’s day. In an ovenproof large pot or Dutch oven, heat the oil over medium-high heat. Add onions and garlic and sauté until translucent. Add the chickpeas, greens, salt, pepper, curry powder, cinnamon and allspice. Stir until combined. Add enough water to reach half way up the mixture. Place in a 350ºF oven and cook for 1 hour, stirring occasionally. The mixture should be slightly soupy. 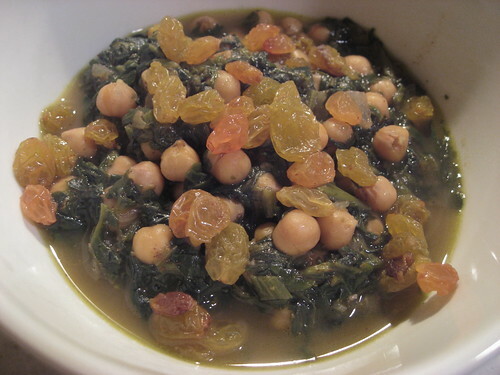 Adjust seasonings and serve alone with golden raisins OR over brown rice. Makes 8 servings. A New Take on Mujadara! Tilapia. A quick, simple, healthy dinner. My very first Daring Baker's Challenge!! !